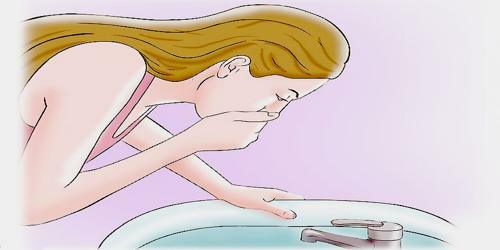 Vomiting is a matter ejected from the stomach through the mouth, usually as a result of involuntary muscle contractions. The causes of vomiting are as wide ranging as those for nausea and include anything from food poisoning or gastritis to head injuries and brain cancer. Nausea is the discomfort that is felt before vomiting but not all nausea actually results in vomiting. In severe cases, where dehydration develops, intravenous fluid may be required. Self induced vomiting can be a component of an eating disorder, such as Bulimia Nervosa, and is itself now an eating disorder on its own, purging disorder. Regurgitation is a different condition from vomiting and the term regurgitation usually means expulsion of the undigested food from the food pipe or esophagus into the mouth, with none of the forceful expulsion or discomfort that is associated with nausea. The two conditions are different as are their underlying causes. Frequent vomiting not related to any of these causes may be a symptom of cyclic vomiting syndrome. 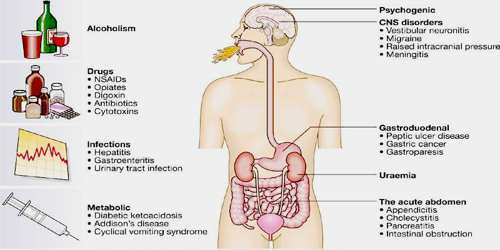 This condition is characterized by vomiting for up to 10 days. It is usually coupled with nausea and extreme lack of energy. It mainly occurs during childhood. Vomiting is a symptom of an underlying condition that needs to be diagnosed for treatment to be effective. 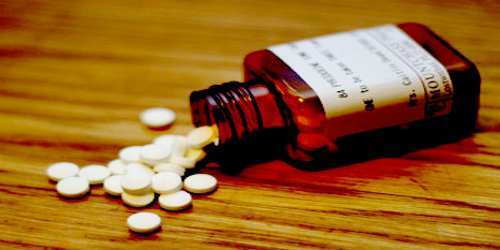 Medications called antiemetics may help reduce nausea and vomiting by speeding up the emptying of the gut to relieve the nausea and uncomfortable feeling of fullness in the stomach. Examples include metoclopramide and domperidone. Severe vomiting due to cancer chemotherapy and anaesthetic agents may be relieved with the use of ondansetron, promethazine, dimenhydrinate, dexamethasone or droperidol. Pregnancy induced vomiting and nausea may be relieved with the use of doxylamine. An emetic, such as syrup of ipecac, is a substance that induces vomiting when administered orally or by injection. An emetic is used medically when a substance has been ingested and must be expelled from the body immediately, for this reason; many toxic and easily digestible products such as rat poison contain an emetic. Inducing vomiting can remove the substance before it is absorbed into the body. Ipecac abuse can cause detrimental health effects. Adopting better lifestyle habits can help prevent vomiting episodes. It’s difficult to entirely avoid viruses that cause vomiting, but people can reduce their chances of getting a virus by exercising good hygiene, like regular hand washing. Knowing how to treat recurrent vomiting can help people avoid further complications.